My couch is not an effing litterbox. | MEOW hear this! My couch is not an effing litterbox. Moosh Moosh laying on the couch in better times. It’s really frustrating to have your cat pee on the couch. Taco, for all his shortcomings, isn’t a BAD cat, per se. But he peed on the couch because he has this Feline Idiopathic Cystitis. I have a really great vet so I have a decent understanding of what this is, although apparently the “idiopathic” part of the name is a fancy doctor word for “we’re not really sure what causes this.” The best they can figure is that for some reason, some cats can’t handle stress as well as regular cats (and if I hear someone say “What does a CAT have to be stressed about? !” one more time I’m gonna punch ’em) which in turn causes their bladders to become inflamed. So then it hurts to pee. This is when they pee in places they aren’t supposed to. Which in my case, is my couch. This is very unfortunate because a) I like to sit there and b) he’ll keep peeing there because he smells it. It’s not like I can just throw the couch in the washing machine with some vinegar. My vet told me to use the cat urine remover, then spray it with vodka. Still smell the pee. Granted, I have to stick my nose right up to it to smell it, but the lil furballs have a much better sense of smell than us. Currently, my couch is covered with a shower curtain and puppy pads. Oh, and cat repellant. I didn’t know they made that and I don’t know what’s supposed to be repelling about it but it only worked for a little while. We went 2 whole weeks and then he did it again Friday. And then again today. I am annoyed. Like, really really annoyed. I know it’s not his fault but SWEET BABY JESUS it’s frustrating. Three litterboxes and you can’t pee in ONE of them? I tried reasoning with him once — it was ridiculous, but I was tired of it. I cried… and told him to “stop it for Mommy.” He looked at me quite seriously, then reached out and swatted a pen on the floor. He’s had a laser treatment for the FIC (I affectionately call this PEW PEW PEW) and about a bazillion other things, but I think his flare-up is over and now he’s just peeing there out of habit. Poor Taco. I once had a dog that had pee problems. None of the vets knew what was going on, so I donated him to the Texas A&M University School of Veterinary Medicine hoping that they could find out what was wrong and help dogs in the future. May 22, 2012 - 6:52 pm Pingback: Toilet training for cats sounds so tempting. « MEOW hear this! May 25, 2012 - 7:21 pm Pingback: Cat food for thought. « MEOW hear this! June 16, 2012 - 9:42 am Pingback: Cat chore of the day – nixing the claws. « MEOW hear this! June 21, 2012 - 7:57 pm Pingback: My Cat From Hell = Jersey Shore « MEOW hear this! June 30, 2012 - 4:10 pm Pingback: You can never have too many posts about litter boxes. « MEOW hear this! August 11, 2012 - 4:29 pm Pingback: Bad kitty mommy again. « MEOW hear this! September 29, 2012 - 1:56 pm Pingback: YOUR LOSS, ANIMAL PLANET « MEOW hear this! 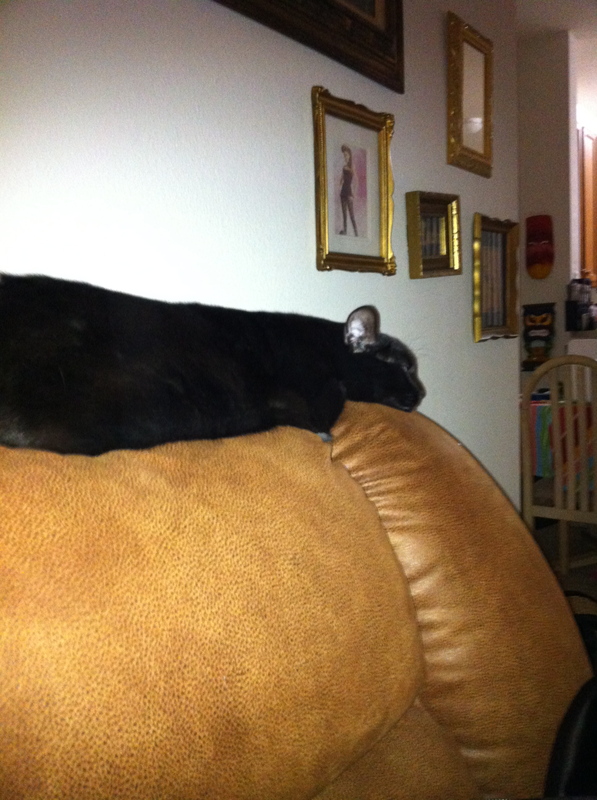 October 12, 2012 - 5:01 pm Pingback: Kitty mommy vent time. « MEOW hear this! October 25, 2012 - 10:32 pm Pingback: Kitty mommy blues. Thanks for listening. « MEOW hear this! Hi there, have you tried Nature’s Miracle Just for Cats spray?? It’s AMAZING and I swear by it. It’s about $10 for a spray bottle and you can buy bigger bottles in bulk sizes and refill that bottle. (PetSmart, Petco, online, etc.) Also, since you’re already working with a vet, I have a couple of other recommendations: 1) dried cranberry extract (sprinkle it on his wet food) and 2) get a couple Feliway pheromone plug-ins for your living room and other nearby rooms. You want to talk about sweet baby jesus, those things are miracle workers! I have actually tried two different kinds of the Nature’s Miracle to no avail…my vet also told me to spray vodka after the cleaner dries, as it takes out some other enzyme the cleaner does not…nothing seems to work, at least not this most recent pee spot. It’s as strong as ever. I don’t get it. I will try the cranberry, I do give him Cosequin on his food now. I have yet to try the Feliway, I tried the wipes (for the carrier, supposed to calm them for the vet) but that didn’t seem to make a difference so I’ve been hesitant to try the plug-in… but I think it’s worth a shot. Thanks! Crazy cat ladies also collect crazy cat facts.